Zebra Plant has exotic, emerald green leaves with dramatic white veins so striking, it is grown for its foliage. The plume of bright yellow flowers emerging from golden bracts in fall are an added attraction. The flowers will only last a few days, but the bracts will stay for about 6 weeks. Cut off the bracts after they deteriorate. Aphelandra squarrosa will often bloom a second time during the year when given enough light. 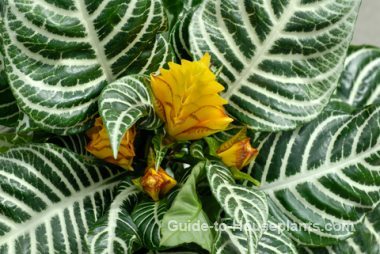 Zebra Plants are often forced into bloom in winter and sold while they're flowering. However, they naturally bloom in spring and fall. Unlike some flowering plants, these tropicals are triggered into bloom by the intensity of light rather than day length. 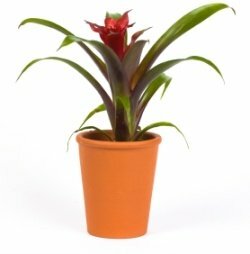 Put your plant in a bright location, but keep it out of direct sunlight or you may see its leaves curl up or wrinkle. Pruning it back. Plants will get leggy over time. Plants that have flowered should be cut down in spring. Cut the main stem, leaving a pair of its lower leaves. In the wild, it thrives in the high humidity and frequent downpours of the rain forest. 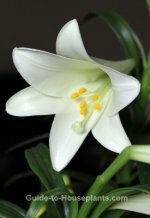 It will thrive indoors, too, as long as its need for high humidity is met. A room humidifier is the most effective way to increase moisture in the air. Or you can stand the pot on a tray of wet pebbles to raise humidity around the plant. Don't be in a hurry to repot. Aphelandra squarrosa prefers to be slightly pot-bound and blooms best this way. Keep it in a smallish pot. Repot in spring when needed to refresh the soil. Wipe leaves often with a damp cloth to keep them glossy and dust-free. There are a few cultivars to choose from. 'Louisae' is a prolific bloomer and the tallest, reaching 2 ft...'Dania' is the most common, shorter and more compact. 'Apollo' has more pronounced white veins... and 'Red Apollo' has a blush of red on the stems and undersides of its leaves. Light: Bright light but no direct sun. Wrinkled or curled leaves indicate it is getting too much light. Water: Keep soil evenly moist year-round. Dry soil will cause leaves to wilt or drop off. Humidity: Moderate to high (aim for 50% relative humidity or higher). Take a look at these easy ways to increase humidity for your tropical houseplants. Soil: Peat moss based potting mix or African violet mix. Fertilizer: Feed monthly spring and summer with a balanced liquid fertilizer diluted by half. Propagation: Take 3-inch (7.5 cm) stem tip cuttings in spring or summer. Cut the stem just below a node -- the place where a leaf is attached to the main stem. Dip cut ends in rooting hormone powder then insert them in seed starting mix or perlite. Enclose the potted cuttings in clear plastic or use a glass cloche to hold in humidity. Set the covered cuttings where they'll get indirect light. Water when the potting medium appears to dry out. After 3 weeks, you can remove the covering. Gradually expose the cuttings to more light. You should see new growth in about 6 weeks.